Bhopal Junction is a chief railway junction of India. It is also the primary railway station of Bhopal, the capital city of Madhya Pradesh. The station serves as the starting point for Bhopal Shatabdi Express, the fastest train of India and the fastest mail express train, Shaan-e-Bhopal Express. Presently, the railway station of Bhopal serves as the main connecting point for a number of pilgrims from neighbouring countries China, Nepal, Thailand, Japan, Malaysia, and Myanmar. People from these countries fly in every year to visit the Stupa of Sanchi. The stupa is situated at about 40 km from Bhopal Junction railway station. Bhopal city is widely known for some amazing tourist attractions. These sites hold a lot of historical importance and splendour. The city is also valued as the magnificent city of the Nawabs. Bhopal city is situated over seven hills along the banks of two scenic lakes. One can visit a number of mosques, art galleries, lakes, and museums that evoke tourist interest in the city. Birla Museum is one of the important tourist sites in Bhopal. It is equipped beautiful galleries and museums that reflect rich cultural heritage of the city. It was established in 1971. The museum has a huge variety and collection of artifacts and remnants ranging from the pre-historic period. The Gohar Mahal is situated behind the popular Shaukat Mahal right on the edge of the splendid Upper Lake. The Mahal was constructed in the memory of Gohar Begum. She was the first female ruler of Bhopal. The palace was built in the year 1820 that showcases the marvellous architectural brilliance of the period. The palace is an ideal blend of Mughal and Hindu architecture. Museum of Mankind Bhopal is another place of tourist attraction in Bhopal. It is also a tribute to the tribal community of the nation. No museum across the globe possesses huge collections hailing from the pre-historic era. Archaeological Museum in Bhopal is a priceless heritage of Madhya Pradesh state. The place holds a wide incredible collection of paintings, sculptures, and artifacts of India. Bharat Bhavan is a multi-art autonomous museum and a center for visual arts and institute for performing. Other impressive places of tourist attractions in Bhopal include Sadar Manzil, Lakshmi Narayan Temple, Shaukat Mahal, Lower Lake, Upper Lake, Van Vihar National Park, Taj-ul-Masjid, Moti Masjid, Sanchi Stupa, Jama Masjid, and Bhimbetka Caves. Hiring a taxi in Bhopal will help you enjoy the tour in Madhya Pradesh and areas around better. 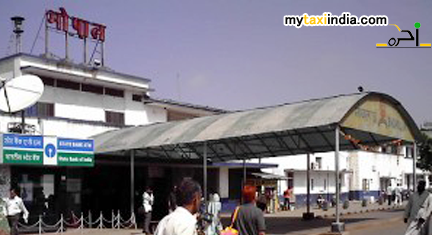 For a trip to Madhya Pradesh, we invite you to hire a taxi for convenient commutation and railway transfer. The services we offer are renowned in the region. The best in class cab hire services are highly appreciated by our esteemed patrons. You can book our services at online portal. At My Taxi India, we ensure proficiency and comfort while travelling through the roads of Bhopal and nearby regions. We are proud to offer you our exclusive range of unparalleled car hire and railway station transfer services at competitive rates. Book a taxi with MY Taxi India and experience the difference.